Hattingley Valley’s multi-award winning delicate and textural sparkling Rosé. An elegant, svelte and super pure wine with delicate nose of hedgerow flowers, it has finesse, vibrant green fruit and a characteristic toasty flavour. Pale gold in colour and well-balanced on the palate showing crisp acidity and fine mousse. It has delicate toasty characteristics from being aged on lees whilst the gentle oak flavour adds complexity. Winemaker Will Perkins enjoys our Rosé 2013 with Cherrystone Clam Chowder served with freshly baked bread..
With this product, you earn 1690 loyalty point(s). 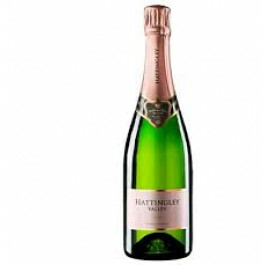 Hattingley Valley’s multi-award winning delicate and textural sparkling Rosé. An elegant, svelte and super pure wine with delicate nose of hedgerow flowers, it has finesse, vibrant green fruit and a characteristic toasty flavour. Pale gold in colour and well-balanced on the palate showing crisp acidity and fine mousse. It has delicate toasty characteristics from being aged on lees whilst the gentle oak flavour adds complexity. Grape varieties: 60% Pinot Noir 38% Pinot Meunier 2% Pinot Precoce Alcohol/VOL: 12.5% Closure: Diam Country: England Food matching note: Winemaker Will Perkins enjoys our Rosé 2013 with Cherrystone Clam Chowder served with freshly baked bread.